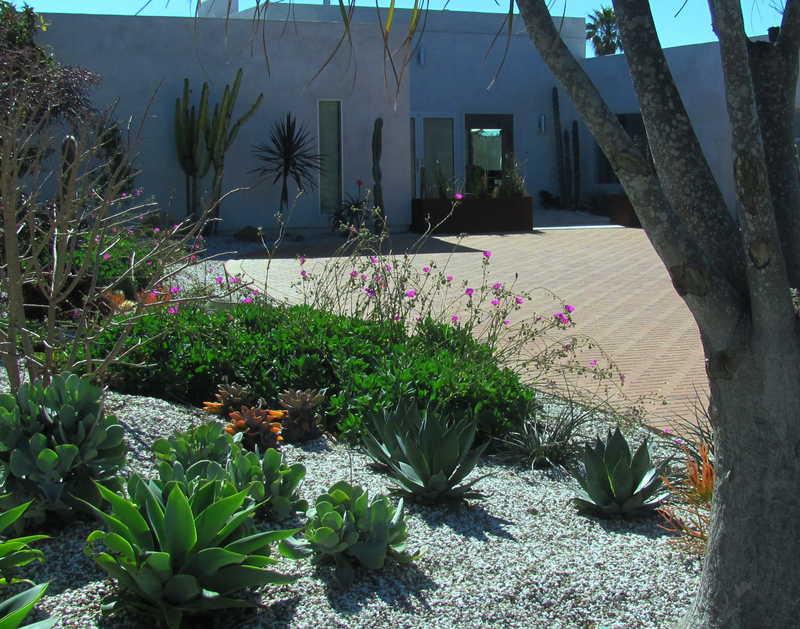 In my previous post, San Diego … Drought Proof Your Landscape, Part 1, I explained the term “xeriscape” and outlined several water-smart landscaping ideas and the first steps towards a water-wise landscape that is beautiful and yet sustainable. Here are the remaining steps a well as valuable resources. 5. Now that you are making voids in your garden (by eliminating certain unsustainable plants), perhaps it’s time to splurge on a few new hardscape elements (patios, walkways, shade pergolas)? In my mind a garden is only a place worth caring for when it comes to life with plants. However, our landscapes need structure and good organization if they are to be enjoyable. And to enjoy them usually means entertainment, relaxation, rejuvenation, and also play and reconnecting with nature in the privacy of our home. it needs to be comfortably accessible from the kitchen when food is carried outside to the dining or lounging table. If you find that any of these elements is missing from your entertainment/relaxation space, now might be the time to remedy these shortcomings and create a comfortable outdoor entertainment space design. Perhaps a new pavement is needed, or a shade device? 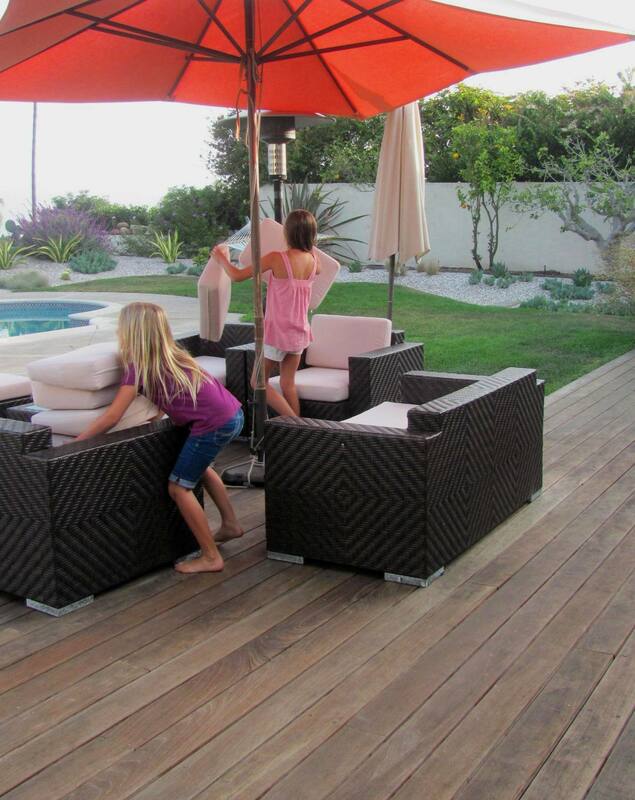 This could be a pergola, an umbrella or shade sails, or (most practical perhaps or economical) a shade tree! And new pathways? 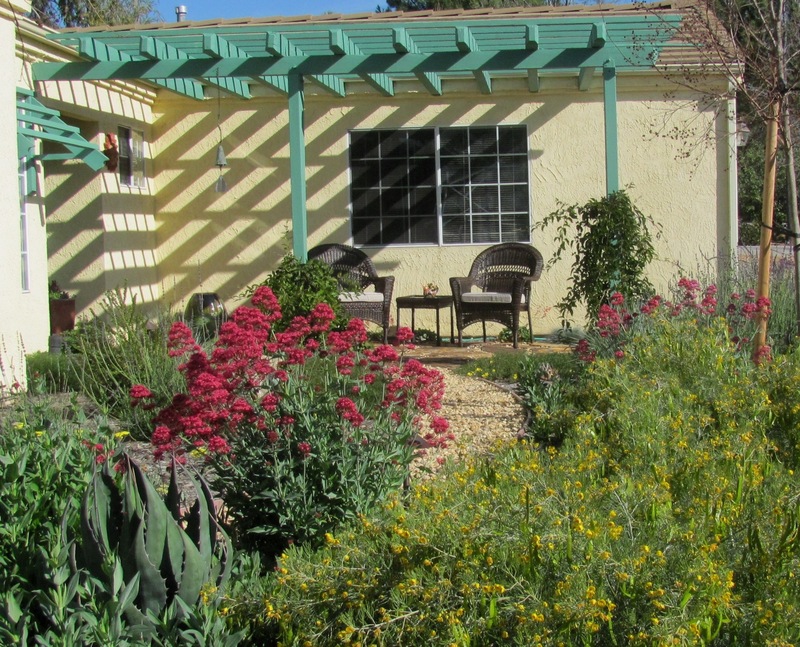 Imagine going on a discovery tour in your garden and enjoying your creativity, admiring what all the beautiful drought tolerant plants are showing off through the seasons. A discovery path that winds around your new planter beds, or a strolling path leading to a bench or comfortable seat at the rear end of your garden could be a long lasting addition that will pay off many-fold. 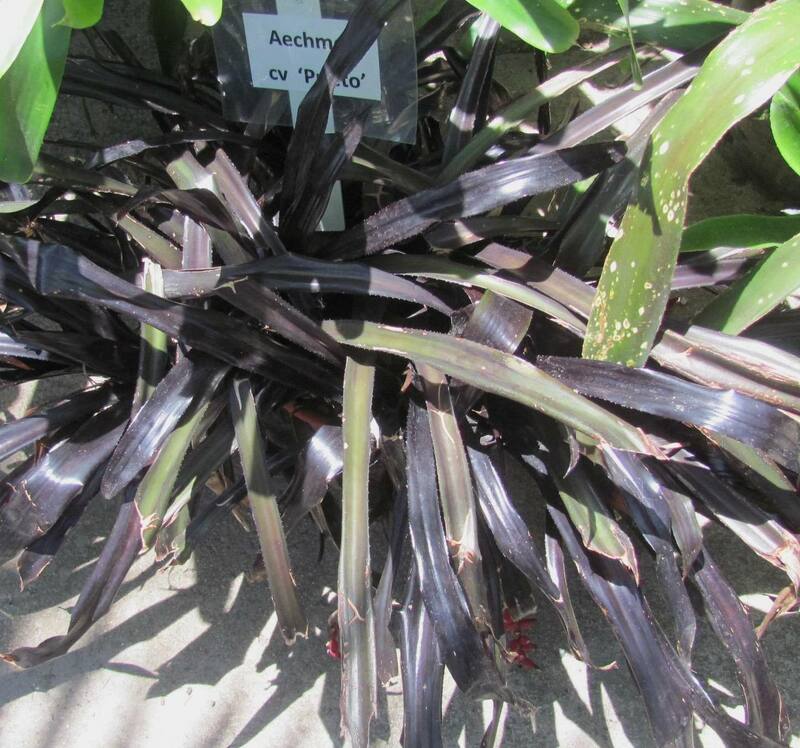 A thick layer of mulch, spread around all plants is so important! It should be 2-3 inches thick, or the kind that includes also small pieces (not the nuggets or the shredded lumber), and not smothering the root crown (the part where the roots converge into the stems just at/above soil level) to avoid fatal fungus disease. A layer like this is attractive, makes your plants stand out, cools and enriches the soil, prevents erosion from rain or hard irrigation, and slows down evaporation. It’s a big water saver, and whatever has decomposed during the year, needs to be replenished in the following spring. 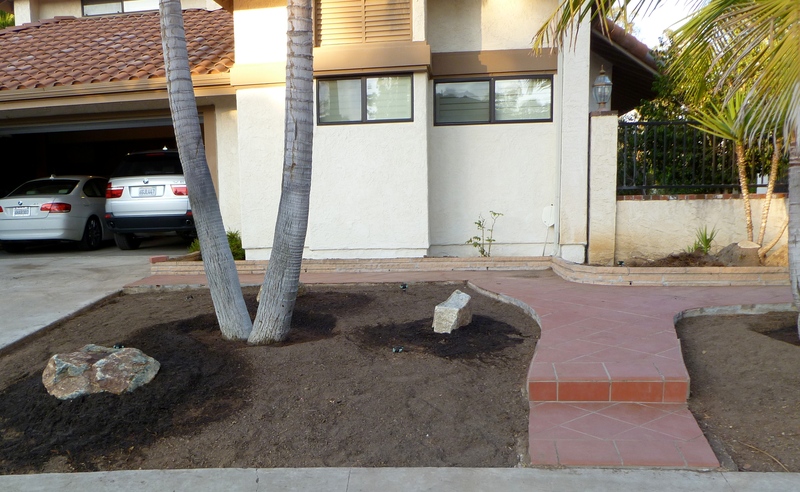 Some landscape are well served with an inorganic layer of mulch, made from decomposed granite or crushed rock. 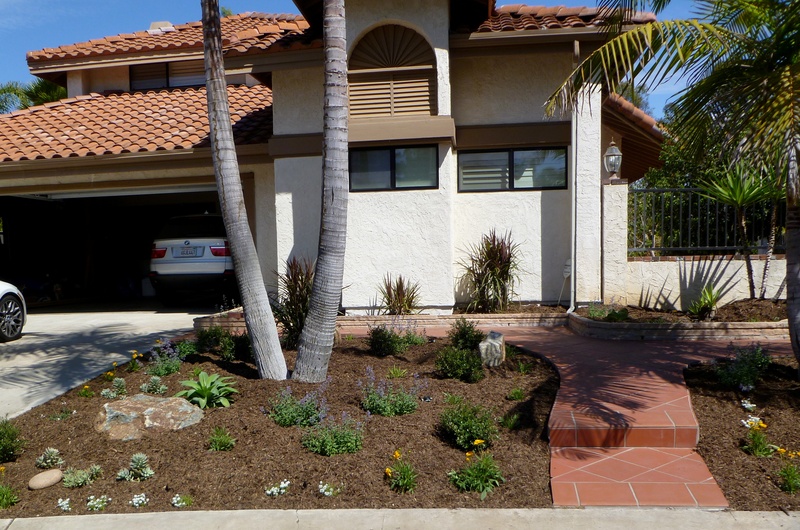 These materials are well suited to Southwest landscape designs or “desert-scapes”, and this type of mulch, although not enriching the soil, can help reduce evaporation and gives a finished look. Knowing whether you have sandy, loamy or high clay soil lets you determine whether to “condition” your soil (by adding compost, organic matter, or other ingredients such as gypsum), which irrigation system to use, how fast water drains into the sub soil and when to irrigate again. It also helps you determine which plants are best for your location. In my mind it’s not as necessary to add nutrients — most of the drought tolerant plants come from areas with nutrient-poor soil — as it is to have organic matter in your soil as this organic matter, as it decomposes, feeds more micro-organisms and creates a healthier environment for plants. So adding compost for example helps you improve your soil. 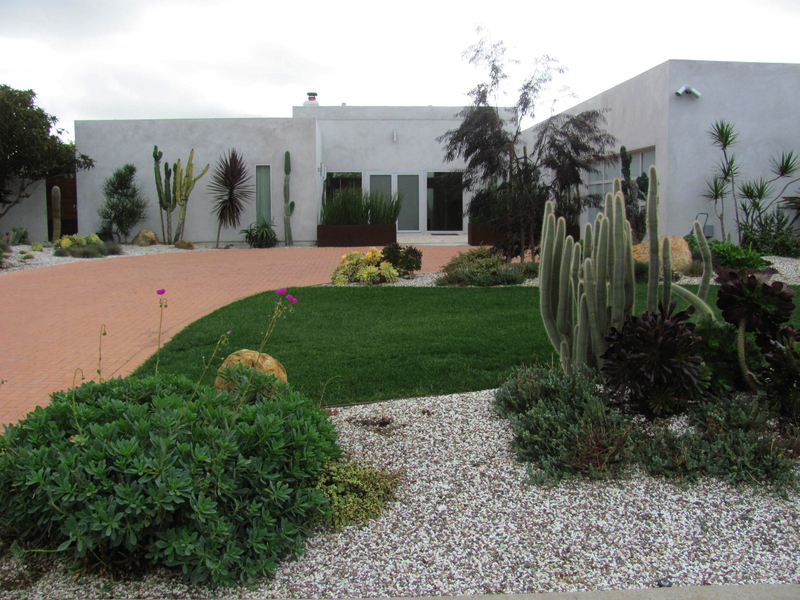 This Homeowner’s Guide to a WaterSmart Landscape Flipbook helps you determine this question. 8. Hand-watering; still a smart irrigation technique? If you have a mature tree in your landscape that “never gets any (irrigation) water”, you might think you don’t need to water this specimen. However, it’s important to consider that our winter was very dry, and that “established plants” can get by without extra water – only if they can tap into a reservoir of soil that was re-hydrated in the winter. With our meager rainfall this winter, there’s nothing much to tap into… I’d get a hose-end sprinkler device , one that you can set on the ground, at the end of your garden hose, and a simple kitchen timer, and give this so important asset in your garden a few deep soakings. It’s important to note that a tree that is stressed doesn’t show its stress right away; it might take a couple to a few years until the stress invites insect attack, tip dying, and eventual demise. What’s deep soaking? Only a soil moisture measuring device, such as auger or soil tube, can prove that your water has sunk in deeply. For a tree that means 18 to 24 inches because in this layer of soil trees usually have about 90 % of their roots. 9. Investigate where your irrigation system might be wasting water. It has been shown in numerous studies that the traditional sprinkler heads and rotors have a mere 50% efficiency rate, and you can observe in your neighborhood (if not in your own garden), how much of runs off before it can get to the plants (such on compacted turf for example, or on slopes); or how much gets blown away by the wind, or how much of lands on driveways or sidewalks. The modern low-volume spray systems or drip are much more efficient, and water used these systems go much farther. 10. Irrigate wisely – not miserly. At planting time all the roots of this plant are in a small confined space – a 1 gal or a 5 gal pot, or larger – and if this plant is not allowed to stretch its roots out far and deep, it will never be ‘drought tolerant’! The establishment phase therefore is crucial: During this phase the water needs to be applied regularly and deeply. To determine how long then your irrigation system needs to run, you will need to a percolation test. Not only is low-volume irrigation more efficient at watering your landscape and therefore wastes less water, it can be combined with a “smart irrigation controller”. This device is tied into weather stations (the better ones even have local sensors) that measure your local temperatures, even relative humidity, solar radiation, and water loss due to evaporation. Combined with your input of the type of plants that you want to water, your soil type and your type of irrigation system it calculates how much and when to water. Lastly, it’s very useful to locate any leaks or breaks that your system might have, and to do a pressure test: Pressure that’s too high can cause more wind-born water and runoff than you want to pay for…A pressure regulator can achieve valuable water savings. 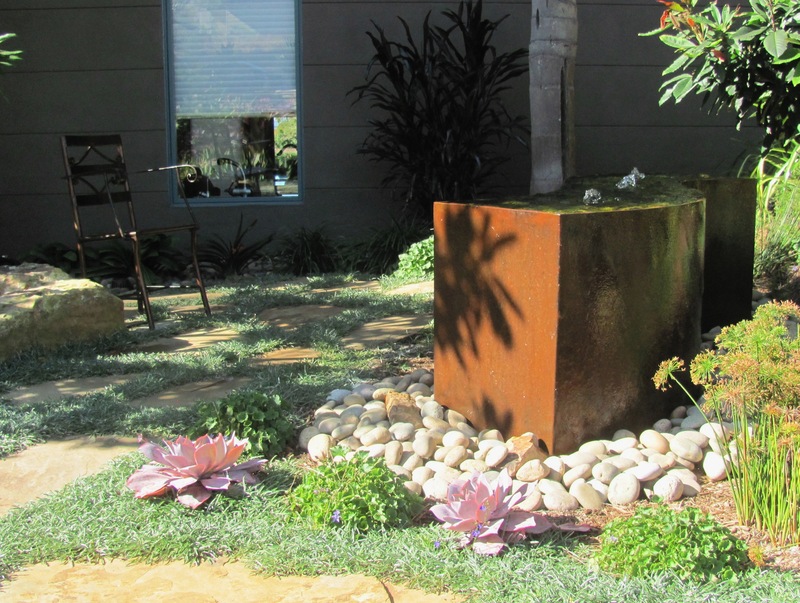 To see how beautiful water-conserving plants can be, the The Water Conservation Garden’s water-wise demonstration garden is a must-visit. The Landscape Watering Calculator computes individualized watering requirements. 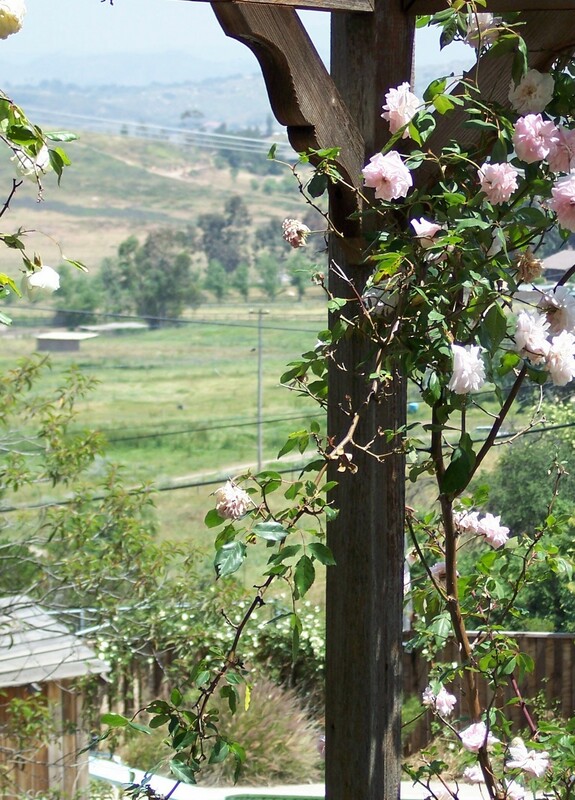 The California Friendly Garden Guide searchable plant database and other useful features. San Diego County Water Authority 20-Gallon Challenge information. On this website you’ll also find more educational resources for students and teachers. 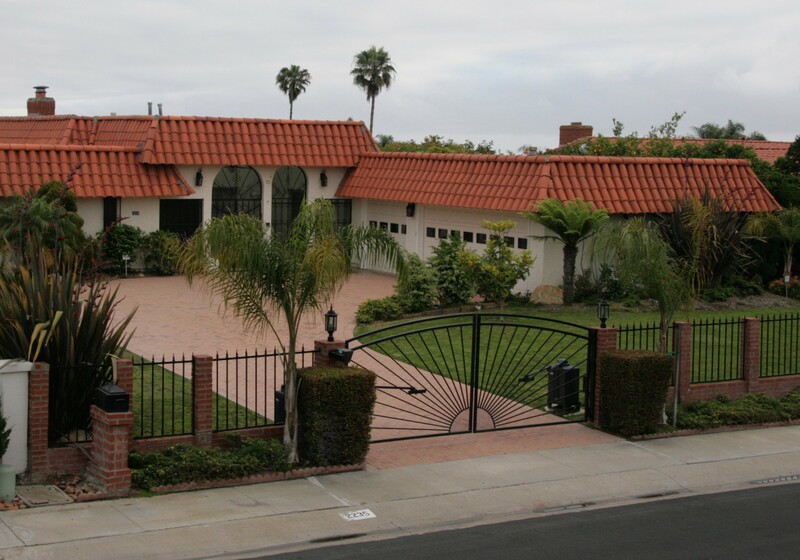 Here’s what you can do to protect your landscape during San Diego’s drought and to do it in style, incidentally. Yesterday morning I stepped outside with my breakfast cereal to soak in the warm sunshine and see what’s going on in my garden. Following the buzz of the bees drawn by the sweet scent of Orange blossoms wafting through the garden, I found the Orange tree covered with flowers – what a joy to see! Taking a deep breath, my eyes scanned the garden, and it struck me that the Plum tree also had started to bloom, and the first Cleveland Sages, and then, coming around my deck, I saw that the Wisteria, pruned barely a few weeks ago, had pushed out big buds ready to open at any moment! But winter is hardly over officially, or is it? With all the delight over warmth and gorgeous spring bloom, I can’t help feeling concern about how soon summer will be here, and how my garden will fare with the watering restrictions that are sure to come? If you, too, can’t help looking anxiously skywards waiting for rain, and wondering how you can protect your landscape from the effects of drought, read on: Here I’ll outline important ideas and tips to help you protect your garden investment and “drought proof” it through the months to come. 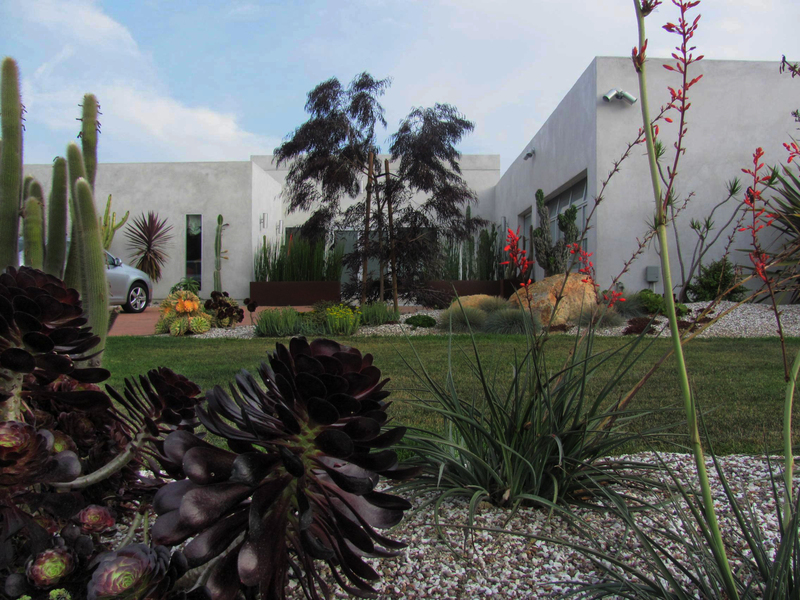 As Wikipedia describes it: “Xeriscaping is landscaping and gardening that reduces or eliminates the need for supplemental water from irrigation. “ It most definitely does not mean ‘zero – scaping’ although it’s easy to pronounce the word that way. 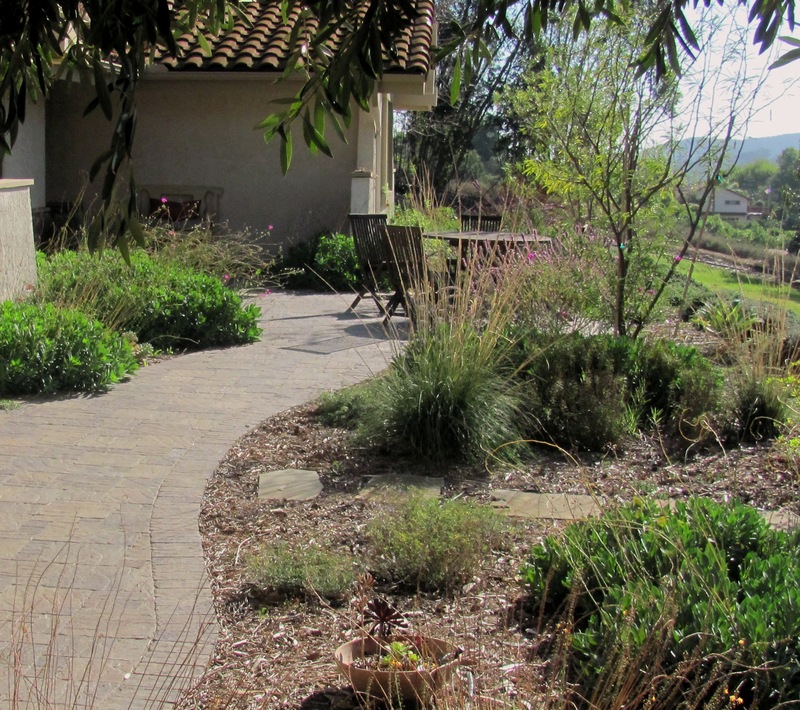 So where does this process of transforming and protecting your landscape as a sustainable xeriscape start? 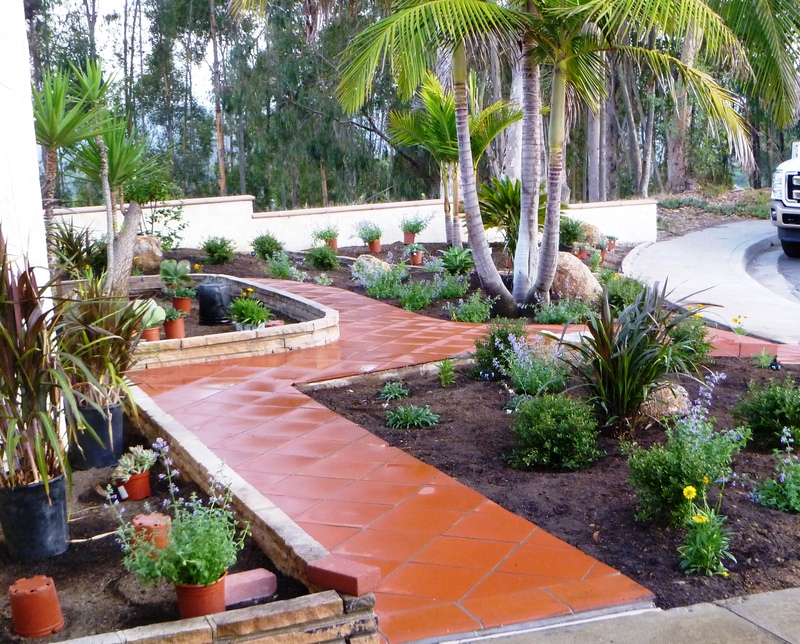 The following steps are very important and will help you preserve your landscape and safeguard it against drought. 1. Decide what to water and what not. 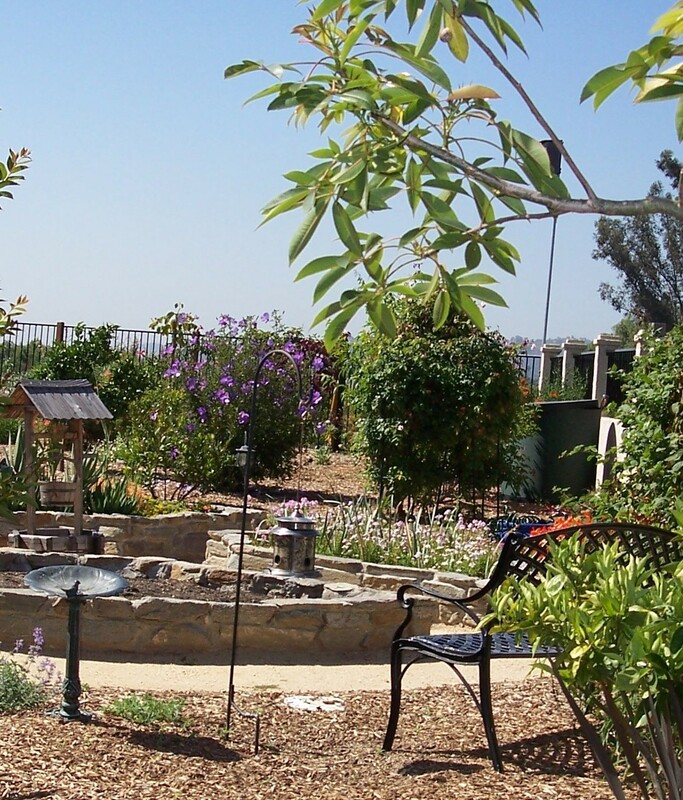 Water is scarce, and watering all of your landscape will be very costly and difficult if not impossible if San Diego goes back to specific days for irrigation. Also, if you have a traditional irrigation system, your irrigation cycles will be even more restricted. It’s therefore wise to only water what’s really valuable in your landscape. It helps to be cold-hearted and examine each plant for its benefits and assets, as well it’s cost in maintenance, water, fertilizer. This is one of the most important steps on your way to water conservation. 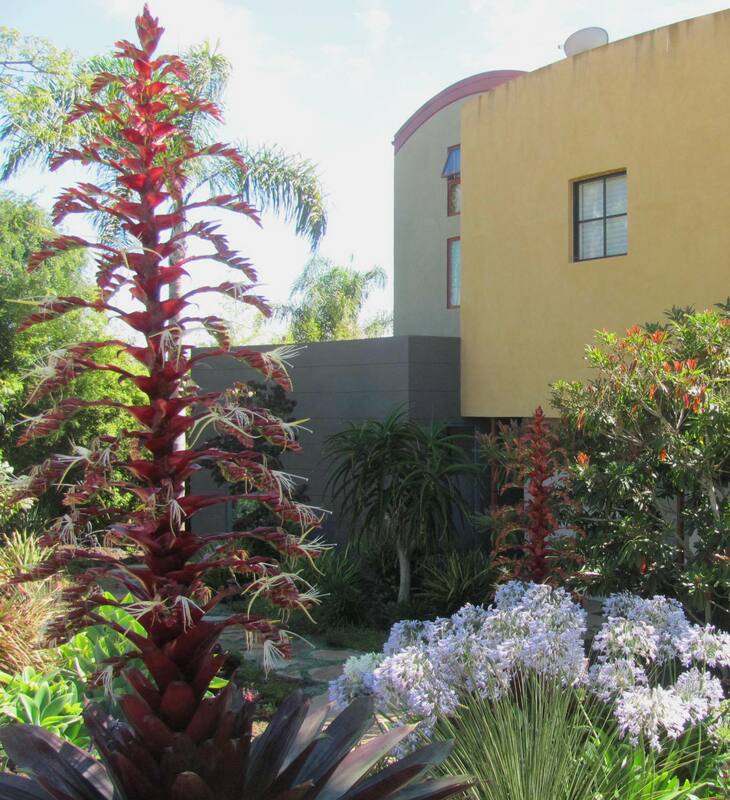 So how do you put a value on the plants in your landscape? I always start “from the top down”, that is with the largest specimen, the trees. A young tree that has already been in the ground for a few years and that is showing promise is definitely worthy of special watering. A mature tree is hard to replace, and it has taken many years and much care to get it to that stage so deserves saving. 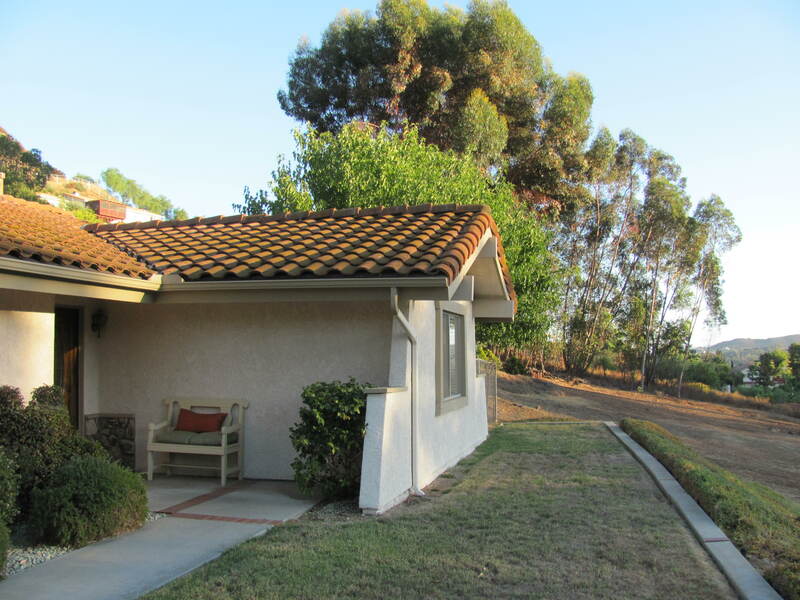 But here, too, I recommend checking whether it really does what it’s supposed to do: Does is shade your house or patio, saving energy in hot weather? Does it provide fruit? Does it provide privacy or screen a bad view? Don’t forget also that if placed right, a tree is a design element that “anchors” your home to its environment and adds an important vertical element and a focal point to your landscape. Now if your tree doesn’t do much of the before listed jobs; if instead it dwarfs your house, sheds needles on your roof or spiky seeds on your patio… If it threatens to drop its branches on your car or the neighbor’s yard… Perhaps it’s the first on your let-go-list? 2. And so you continue with the shrubs, and then the other smaller plants, and then perhaps the lawn. In reality, we often put up with shrubs that are too big for their space and need to be pruned regularly; that easily get infested with white flies (such as hibiscus), need lots of water, and some of them are plain boring (imagine our ubiquitous Indian Hawthorne hedges). If your shrubs have this problem or don’t do much screening or don’t provide privacy… Nor provide food for your family and don’t show a real asset to your landscape, perhaps they are next on the to-lose-list? Turf needs frequent water and maintenance. It dominates the garden scene without ever being visited by hummingbirds, butterflies or other wildlife except for rabbits and the occasional mocking bird. 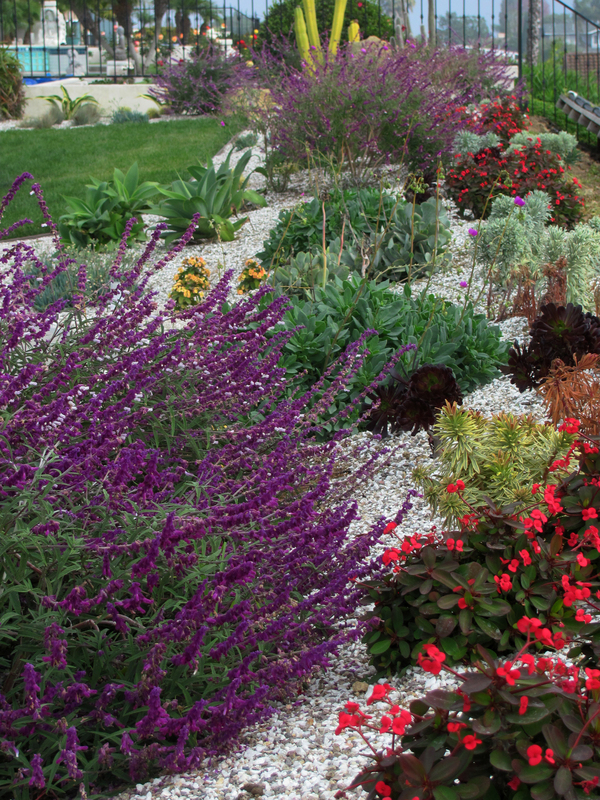 If you select to let go of the lawn also, and decide to create a more sustainable landscape, the rewards are plenty, as there many options for a more colorful, more interesting landscape with fascinating, drought resistant plants that will excite you year-round. 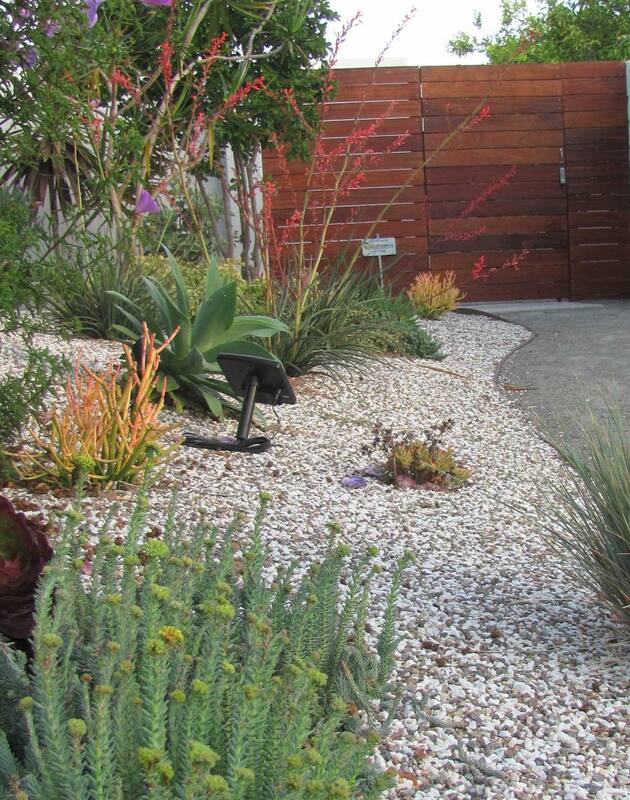 Drought resistant landscaping can be exciting and rewarding year-round. 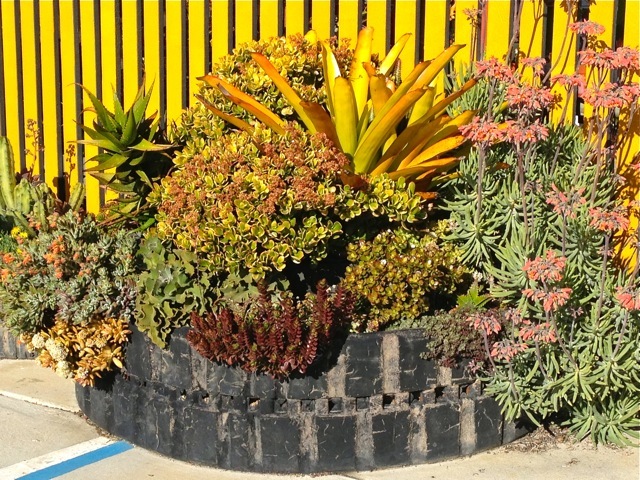 Aren’t you getting excited yet about the new opportunities for a DIY landscape design that brings year-round fun and color in your garden (and incidentally substantial water savings)? 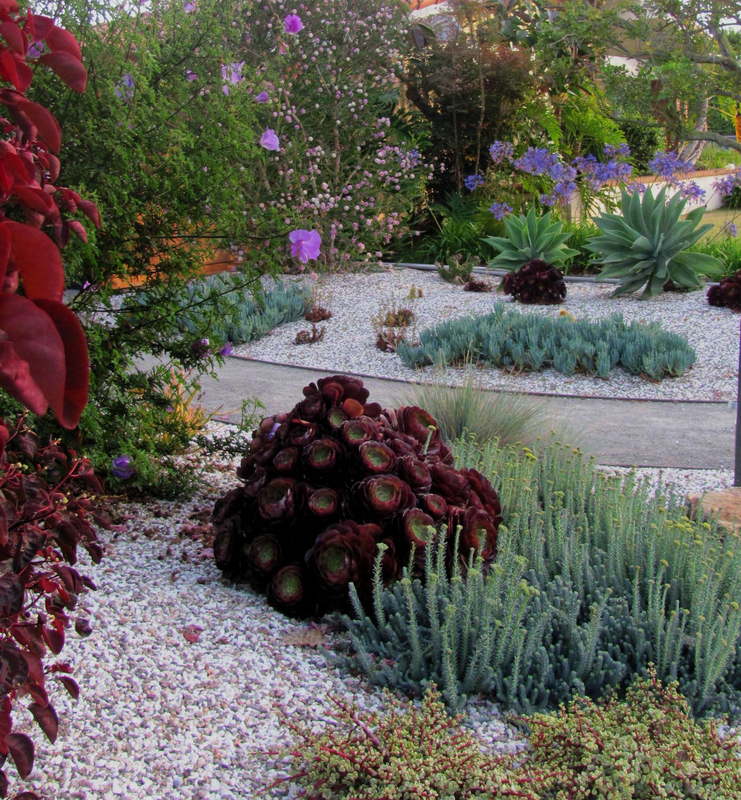 There are so many xeriscape plants that stay attractive year round even with very little extra water, that are colorful even when not in bloom, that entertain with fantastic shapes and textures, and that bring life and nature to your garden. 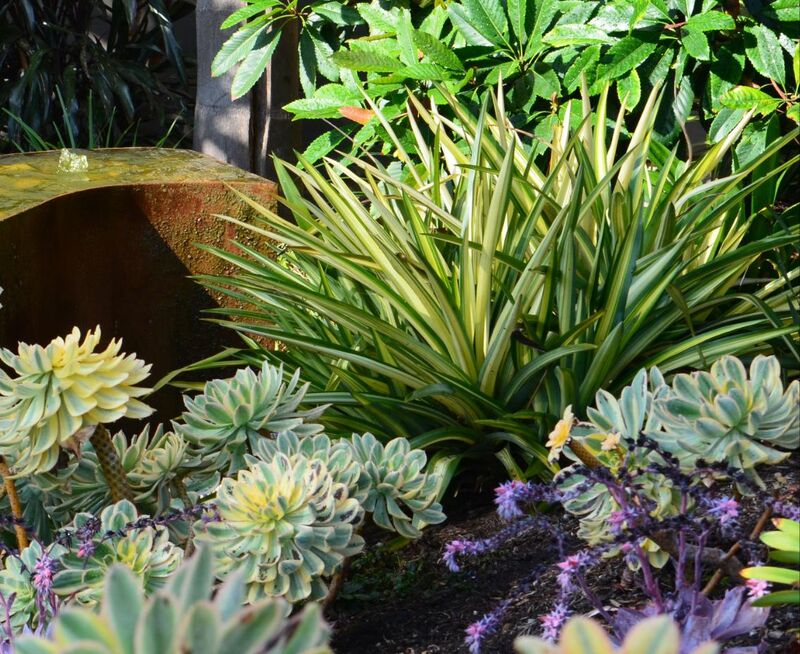 These plants inspire landscape design ideas that could include a strolling garden instead of a lawn; or, fancy a discovery garden with exotics that only need a fraction of what you applied until now, whether California natives or from other Mediterranean climates. 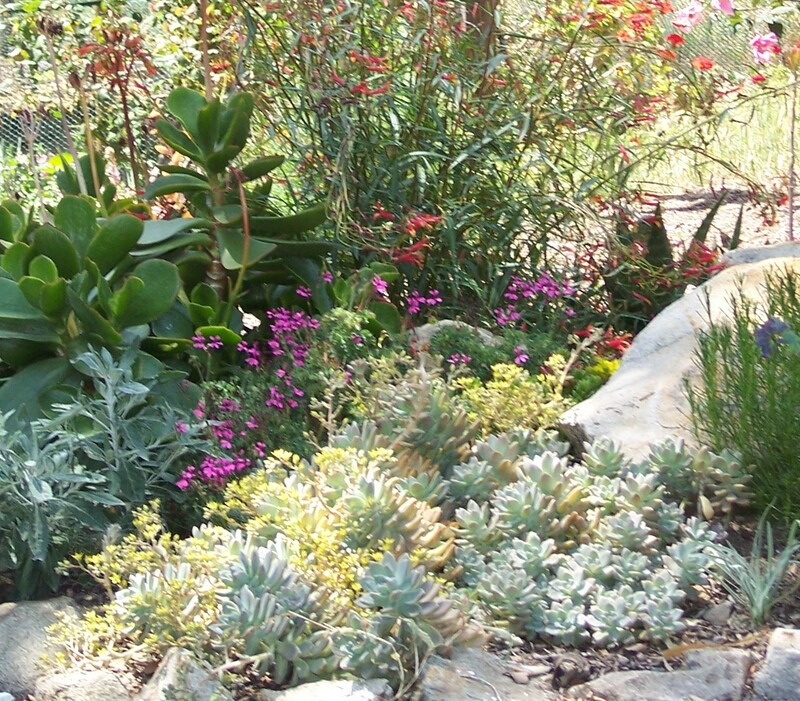 This is the promise that drought tolerant plants hold. They alone, when chosen for your site and for your soil and microclimate, will not need no or only insignificant amounts of supplemental water. 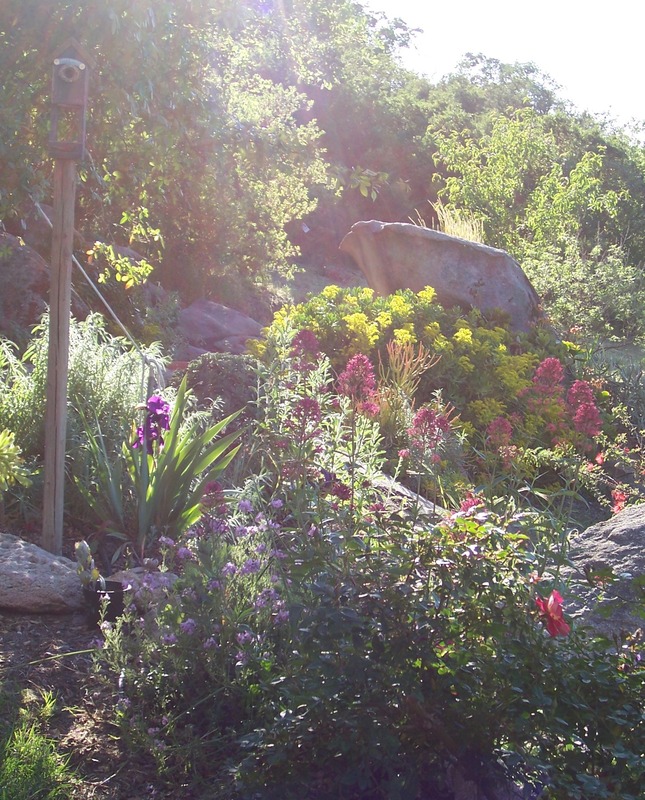 You can browse the UC Davis publication “Arboretum All Star Plants” that lists beautiful low-water plants by type and gives names, space and water needs, required exposure, and photos. 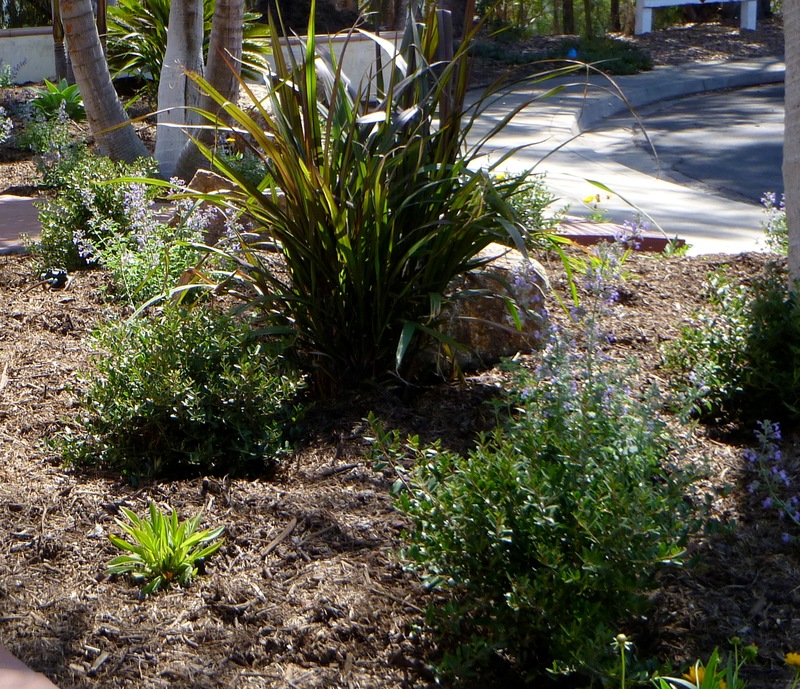 How to bring your irrigation system up to the task; the importance of mulching and knowing your soil, selection of materials – all these issues are crucial elements in your efforts towards protecting your landscape from the drought and enjoying it, too. Look for these and more Resources to help you in your work in the second half of this post to be published next month. For most of us, the garden is the primary place where we connect with nature and reconnect with ourselves. Here’s where we unwind, drawn by the privacy of the space or a pretty view, either of a distant scenery or or of close-up plant beauties. Here’s where we want to be touched by nature’s power; our gardens are our oasis, where we recharge, remember how we played as children, and enjoy a living creation. A chair placed close-up to contemplate the fountain, across from the kitchen window: This scene is very calming, whether seen from inside the house or from close-up. When looking for relaxing garden ideas, consider this: The space that we choose for our relaxation needs just to be big enough for a couple of chairs and perhaps a small table . Where we place it depends on environmental factors or our lifestyles: It could be in the backyard if it provides the privacy you need; if the front yard is the shadier place when you’re likely to be home, the front yard landscape design needs to provide for the relaxation spot here. 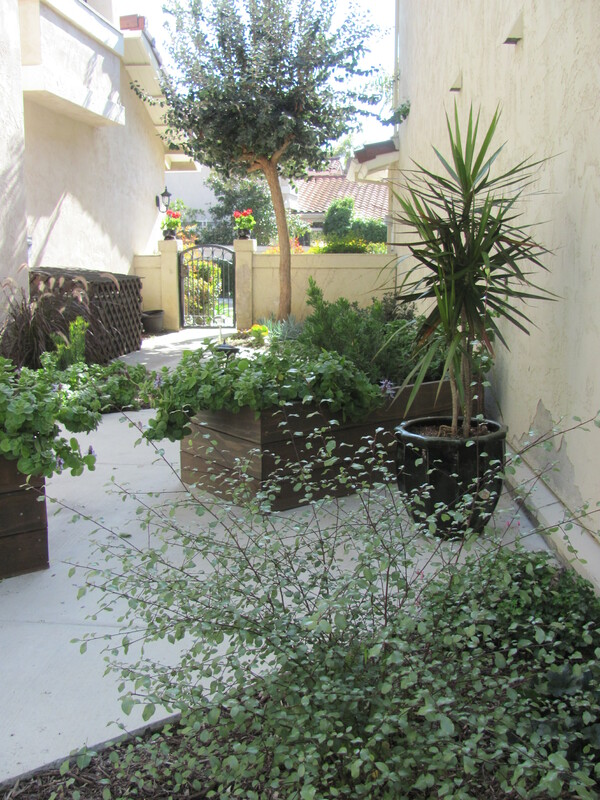 It could also be in our side yard – if that is the only private space there is. This front garden has a view, but nothing to mitigate the harsh sunlight, nothing to complement the forms of the house, nor does it invite to draw a chair to enjoy the view. Placing the sitting area by the front door made most sense because it’s from here that the view is best. However, it’s the plants – ornamental grasses, graceful trees and a variety of colorful xeriscape plants – that make this garden come to life, and it’s here that you want to unwind. 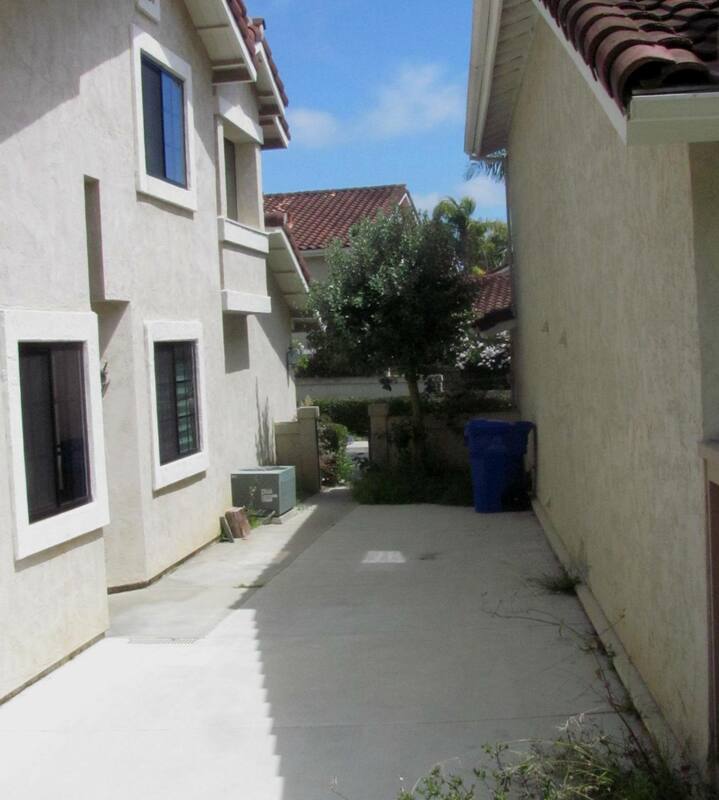 The builder had placed both houses close together, and for the previous owner paving the entire space seemed right. Nothing mitigated the harsh glare from concrete and masonry; nothing was alive and made home-coming enticing. 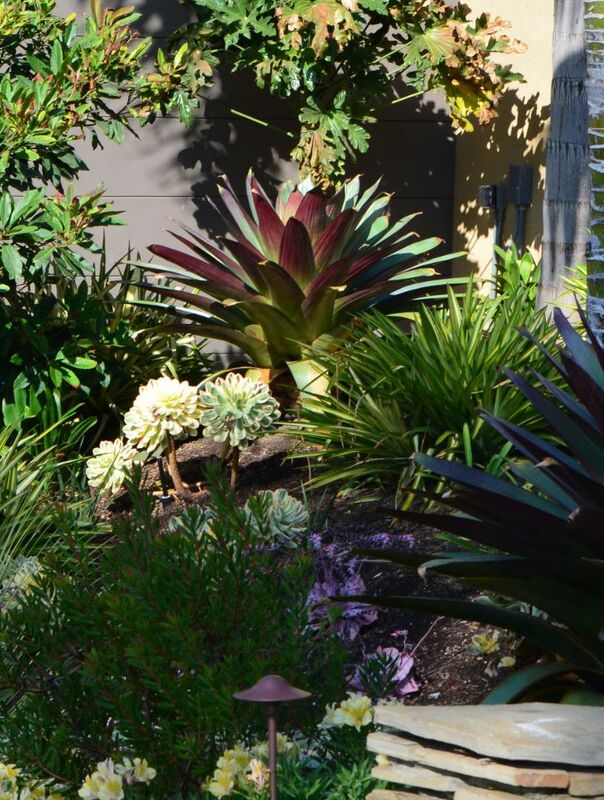 Now this formerly dull entry passage is alive with lush yet xeric plants; it makes you say Ahh when coming home, to a place where moving foliage and varying textures and colors engage and relax the senses. Delicate shrubs decrease the glare from the white walls and soften the forms of the masonry, add visual interest and welcome anybody who enters this patio. 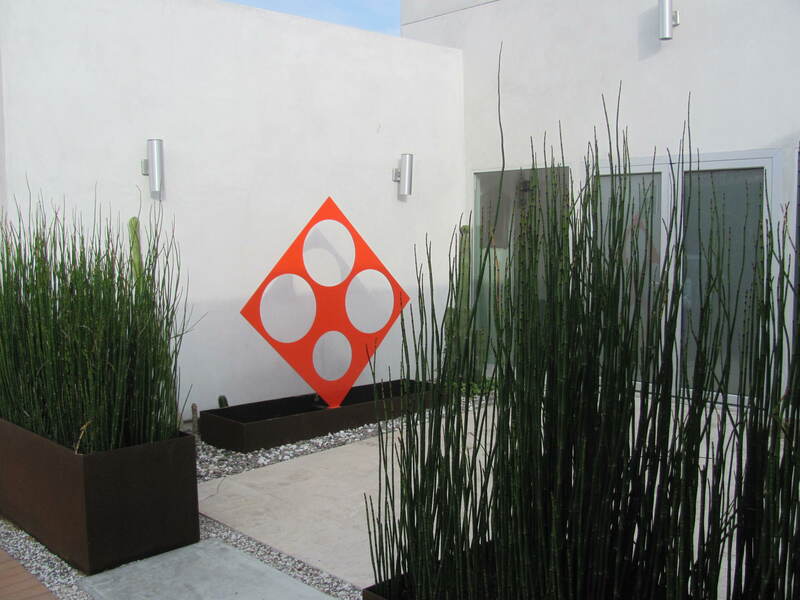 Placing the raised containers at a 45 degree angle allowed to play with the spaces; as the hall-way feeling was broken up with plants and shapes, some sense of discovery and excitement was added. Here, too, the front door area offers the place of choice to take a break and enjoy the late afternoon sun, the view and the occasional chat with neighbors who pass by. Under the cover of the pergola, surrounded by long-flowering Red Valerian Centranthus ruber and Feathery Senna Cassia artemisioides, both xeriscape plants, resting is very enjoyable. A private sitting area was added to this back garden; what better spot than under the canopy of a tree to place a chair and sit with a book? It seems that it is never the material underfoot that matters, nor the size of the spot that we choose. What does matter it our preferred location, some sense of shelter and privacy (placed against a wall, under a pergola or a tree canopy), and the plants that create the interest up-close. It’s the plants that relax us and make the space emotionally resonant, that give the garden a settled feeling, and make the formerly harsh or naked spaces inviting and friendly. Wouldn’t you agree? 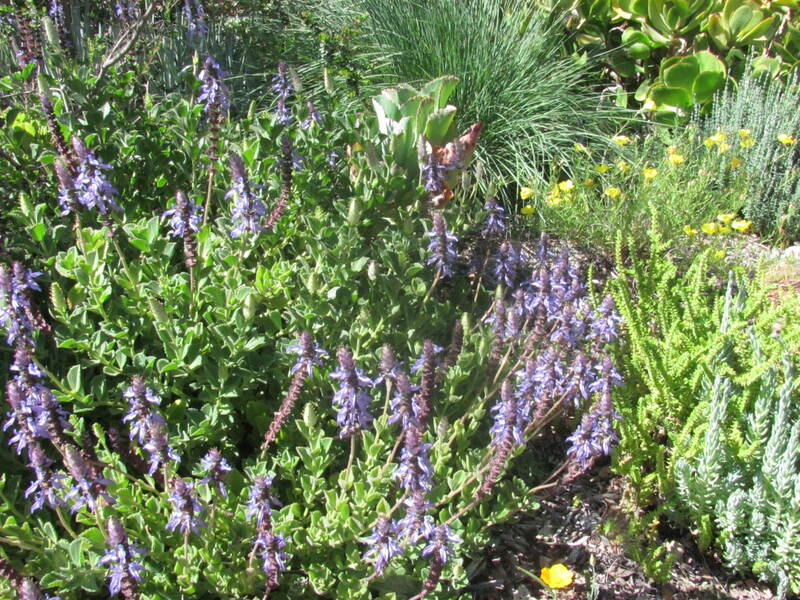 I have a passion for drought tolerant plants, and on one of my last visits to Quail Botanical Gardens in Encinitas (now San Diego Botanic Garden) I was attracted to a plant that looked it would fit the bill: Growing in pure gravel, in the heat of summer, surrounded by other succulents and cacti it was producing cheerful blue-purple flowers. This was one that I had to try out myself, and I have since fallen in love with it. 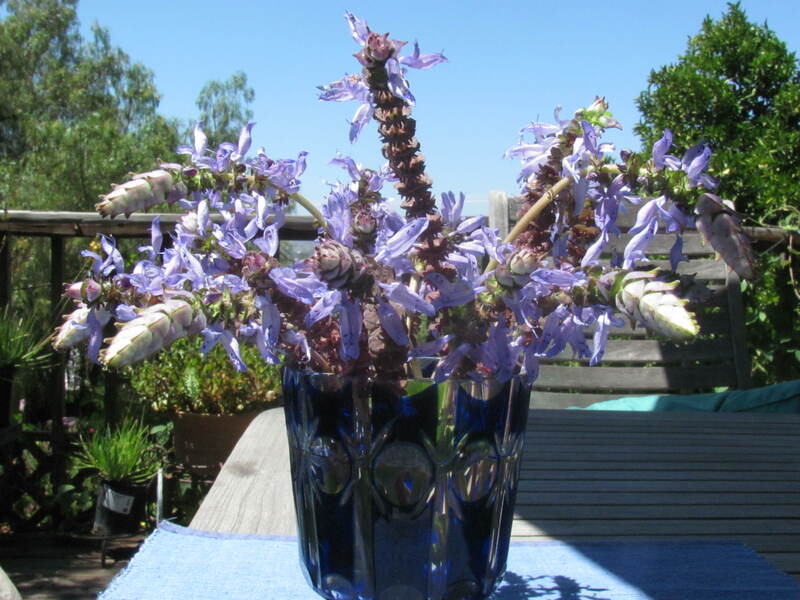 Some call this South African succulent perennial Lobster Flower, but it also goes under the names of Green Aroma, Dogbane, or Spur Flower; its botanic name is Plectranthus neochilus. In my hot inland garden it’s now entering its second summer, and it has proven to be all that I would want from a plant that I select to embellish my or my clients’ water-wise garden. 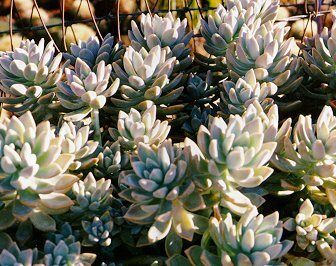 It is hands-down attractive with fuzzy, slightly scalloped pale green aromatic foliage that stays under 6 inches tall in the full sun with little supplemental water but can get taller in the shade with enough water. 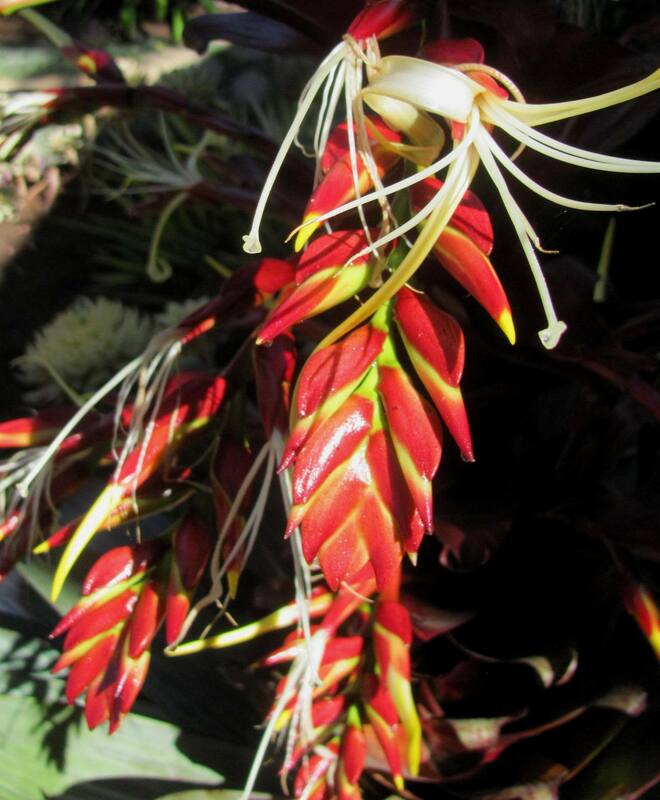 Bloom: With enough sun it blooms almost year-round with about 3 to 6 inch tall spikelets along which fragrant blue-purple tubular flowers are arranged that rise above the foliage; in the hot summer sun it is a relief to see that cool intense color. Spread: Mine have spread, starting from a cutting a year ago, to about a foot and a half wide, and they are supposed to continue slowly as the seasons go by. (Propagation from cuttings is extremely easy: Just break off a stem of about 4-5 inches length, remove the lower leaves on 1-2 inches, snip off the flowers, then let dry in a shaded place for a couple of days. 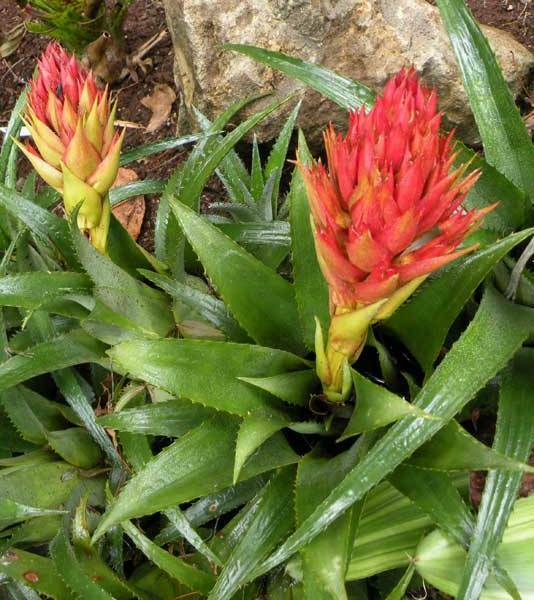 Then plant in moist succulent mix, water in and let sit in partial shade for several weeks [don’t forget to keep moist]. I would not plant it out into the garden until the nights are cooler again; otherwise, the young roots might get burned in the hot soil during the summer months). Soil: The Dogbane or Lobster Flower, like most xeriscape plants, needs well draining soil (although I have the feeling that with careful watering it would also do well in heavier soil). Use: It can be planted at the foreground of a planting bed as colorful ground cover; in the shade it is attractive as well. 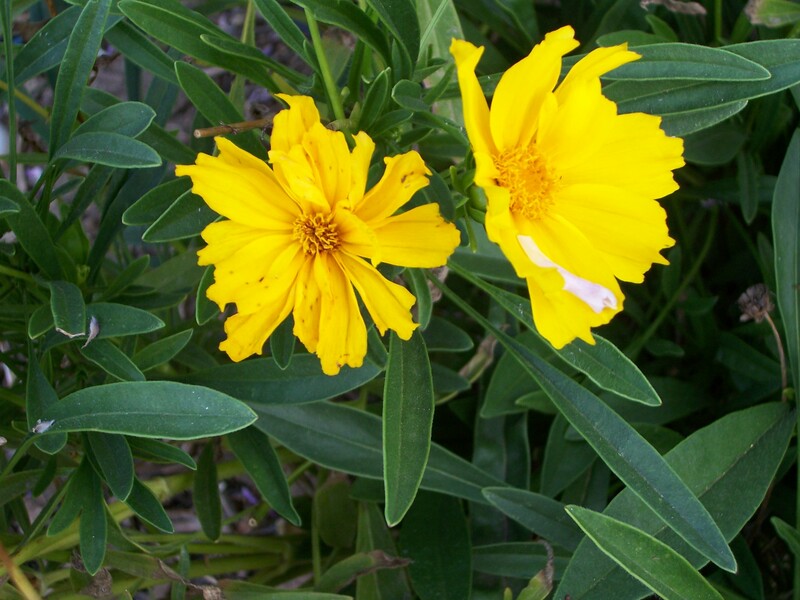 It drapes nicely over any edging and would make also an attractive plant for hanging baskets or containers. Hardiness: It is hardy to around 30 degrees; mine were hit a bit by frost, but the damaged branches were easily removed. Deer/rabbit resistance: Some sources say that it is deer resistant; rabbits have not touched mine so far. 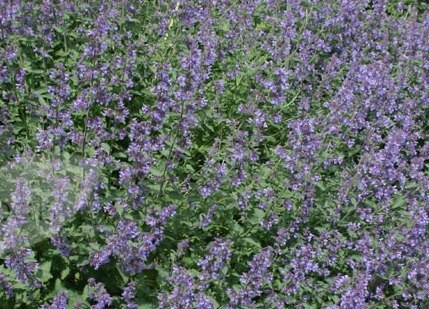 Water/light needs: It tolerates considerable amount of drought and neglect, and although it prefers full sun or partial shade, it does well in the dry shade also where it makes an attractive ground cover. 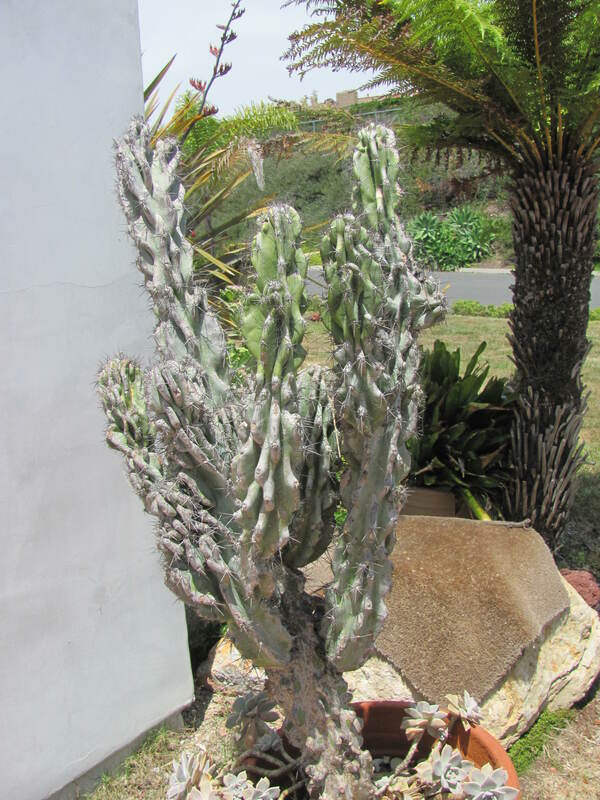 I would find it an irresistible addition to any desert garden. With all these attributes, this little perennial is an adorable, rugged and pretty ground cover for the water-conserving, sustainable landscape. What more could you want from a garden friend?